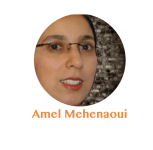 Amel offers tailored SEO & Web Analytics private training sessions and online courses. Her goal is to help entrepreneurs and business owners increase their sales funnels conversions and improve their digital marketing campaigns' ROI. Thus, helping them grow their business tenfold. She also mentor in-house Marketing and SEO specialist to help them grow their expertise and advance their career. Are you frustrated when it come to increasing your website traffic using SEO Analytics? You’re not alone!